This is a Lionfish. Once limited to the Indo-Pacific region, they’ve invaded the waters of The Atlantic, Gulf of Mexico, and Caribbean. Lionfish eat a lot of young fish and shellfish, and with no predators of their own, there’s been a population explosion. By eating, outgrowing, and out-reproducing the native species, these fish are taking over a lion’s share of reef ecosystems. Containing this invasive species is a difficult task. So if we can’t beat ‘em, why not eat ‘em? That’s the plan that fishery managers have cooked up. They’ve started a campaign to urge fishermen and restaurateurs to catch lionfish and put them on menus. This may be the only way to slow the population explosion and save local fisheries from disappearing. As a part of that effort, NOAA and other organizations have set up Lionfish derbies. These team competitions have scuba divers and snorkelers taking to the ocean with spears and nets to collect as many lionfish as possible. After the derby, scientists will collect Lionfish samples for research and chefs get the rest to prepare some tasty party platters. Lionfish can be prepared to anyone’s taste: deep fried, blackened and sautéed, and even made into sushi. And with so many other recipes, and such a bountiful supply, don’t hesitate to ask for seconds. 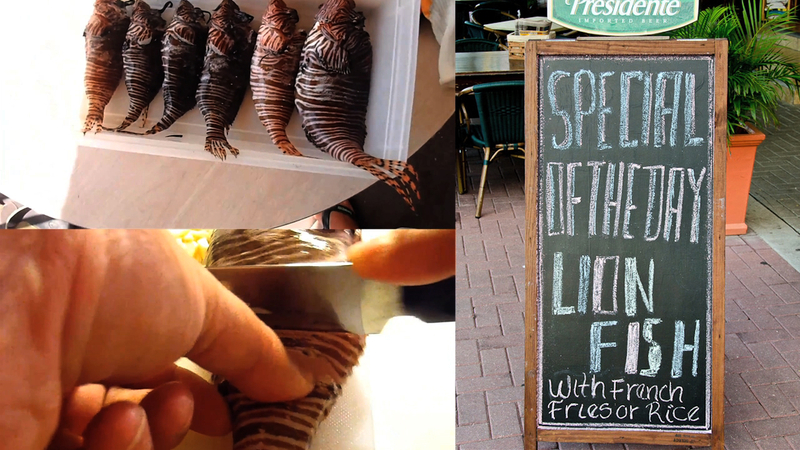 Eating lionfish is a catchy and delicious solution to the population problem. So, why wait? Get’ em on your plate! In the Caribbean, a single female lionfish can spawn over 2 million eggs per year -- that's a lot of babies. The beautiful spines on lionfish are actually poisonous to other marine predators. Of course these spines are completely removed before preparation to eat.